***IMPORTANT*** : Please download from the URL rather than the .zip file... Quadropolis crapped out multiple times and wouldn't let me upload a new file directly, so I had to use a Google Drive link instead. Sorry for the inconvenience, but perhaps a mere 2.9Mb is too much for quadro here. The URL download has 3 additional skin options, improved colorization/contrast on the original bloodysaw, and improved masks for all the saws. Anti-camp 9000?! I need it! Ill tell you my opinion tomorrow. But judging by the screenshot looks great. I like it, can't say much more than that as feedback. 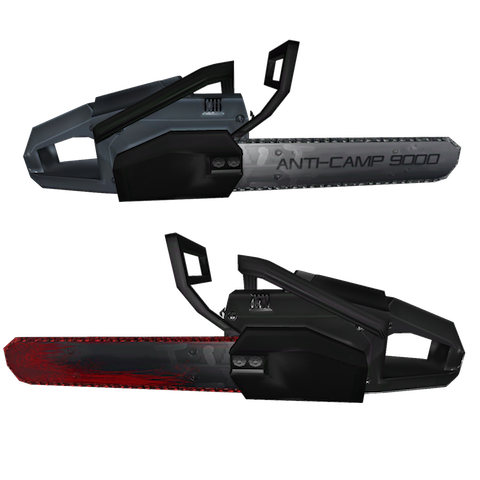 Its a pretty awesome chainsaw, but in game looks pretty normal, using thirdperson 2 is the only way to apreciate it at his max... (The anti-camp 9000, because im not interested in the tomato slicer).